Habit: Annual, glabrous except stem woolly at base. Stem: vine-like, climbing, 9--100 cm. Leaf: petiole 0--5 mm; blade 6--50 mm, linear to ovate; distal linear, sessile. Inflorescence: flowers 1 in axils, opening and cleistogamous; pedicels 3--10 cm, thread-like, twining, subtending branchlets generally 0. Flower: calyx +- glabrous, lobes 3--4.4 mm, equal; cleistogamous flowers minute, white; corolla of opening flowers 10--13 mm, yellow and gold with maroon flecks on lower lip. Fruit: 3--5 mm, spheric; chambers equal, fragile, opening by irregular bursting on sides. Seed: +- 1 mm, ovoid to spheric, black; ridges 4--6, thick, wing-like. Chromosomes: n=15. Synonyms: Neogaerrhinum filipes (A. Gray) Rothm. 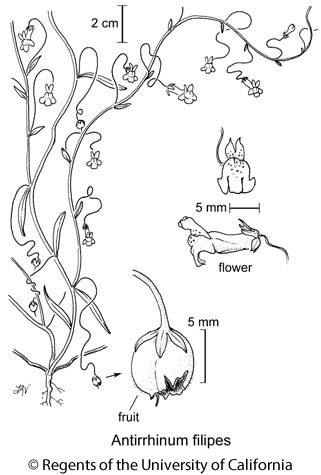 Citation for this treatment: Margriet Wetherwax & David M. Thompson 2012, Antirrhinum filipes, in Jepson Flora Project (eds.) Jepson eFlora, http://ucjeps.berkeley.edu/eflora/eflora_display.php?tid=13566, accessed on April 19, 2019.